HD RAM - WHEELS & TIRES Heavy Duty wheels and tire discussion! Finally made a decision about which tires will replace the OEM Firestones, which I do not like one bit. I had been leaning toward Coopers, since I've run a lot of Coopers over the years and never been unhappy with them. I'm running the Cooper M+S as winter tires, with studs, and they are awesome. But as an old motorhead with fond memories of running Pirelli tires many years ago and being thrilled with them (as young bucks we went nuts over the huge leap forward in performance provided by the Pirelli Cinturatos way back in the 1960's - they truly were revolutionary at the time) I decided to take a flyer on the Pirelli Scorpion AT plus. Not much in the way of reviews so far, but got them installed a few days ago, and we'll see how it plays out over time. Visually the tread architecture is not dissimilar to BFG KO2's. Maybe just a little bit less 'aggressive' a tread pattern with a few extra sipes, all of which are full-depth. They are currently running about $160 less, for four, than the BFG's too, and close to $50 less than the Coopers. My initial reaction is all positive so far. The first thing I noticed is that, once mounted they needed only very minimal weights—the heaviest was a 1.5—to zero out the balance machine. I hopped on Interstate 70 after leaving Discount Tire to see how they felt at speed and they were great. Very stable and quiet with good tracking and no noticeable vibrations of any kind at any speed, including a couple of short bursts up to 95mph. Naturally, since I took off the winter tires and rims to install the Pirellis, we got a spring snowstorm the very next day. Performance in those conditions was excellent. The gravel road up to our house is a steep series of switchbacks requiring 4WD under even the mildest winter conditions, and even with a 4" snow cover there was no noticeable loss of traction. I'll update this review after a few thousand miles, especially after some miles with our 2800 pound Arctic Fox in-bed camper loaded. 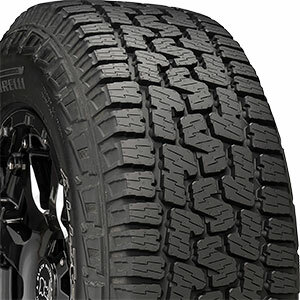 Thanx for the review,been thinking of replacing my stock duratracks with these or the nitto terra grapplers,I have had really good success with both brands,(the pirelli's look a little more aggressive to me,which is why was leaning towards them). Thank you for sharing your initial impressions, 9thousandfeet and thank you for choosing Discount Tire! Just returned from the first camping trip with the Arctic Fox loaded in the truck bed. Still very happy with these tires after a 700 mile trip. Did some backcountry boondocking in 4WD as well as several hours at highway speeds. Very good traction off road. Tires are quiet and very stable, and I noticed that they actually seem to heat up less than the OEM Firestones. The OEM tires at highway speeds would go from 65 to 75 psi in the front and from 80 to 95 in the rear due to thermal expansion. The Pirellis have been going from 65 to 71 and from 80 to rarely over 90. With the Pirelli's much more aggressive tread architecture I had kinda been expecting them to heat up more rather than less, and take it as a positive sign. I didn't take any kind of a hit in gas mileage either, again an unexpected outcome for a tire with a fairly aggressive AT tread pattern. We'll see how they perform so far as being durable over the long haul, but so far I'm feeling pretty encouraged. The tread is a bit strange as I see the letters r,s, and j across the tire when I look at them.